“We found that the mathematics curriculum was a mile wide and an inch deep: it was an underachieving curriculum. It was not the students, it was not the teachers; it was what we were teaching. The way we wrote the previous state standards, there was way too much to teach and too much to learn.” – Phil Daro, on the development of the new CCSS-M standards. Phil Daro, coauthor of the new Common Core State Standards – Mathematics (CCSS-M) and field site director for the SERP Institute in San Francisco, was in town October 15-16 to speak at a series of three Math for America San Diego-sponsored events focused on the Common Core State Standards – Mathematics. Daro spoke at Math for America San Diego’s (MfA SD) inaugural Teacher Leader Collaborative (TLC), a new, two-year professional development program designed by MfA SD and supported by the San Diego Unified School District (SDUSD), UC San Diego’s Department of Mathematics, UC San Diego Extension and the CREATE STEM Success Initiative at UC San Diego’s CREATE (Center for Research on Educational Equity, Assessment and Teaching Excellence). The Collaborative, in the works since last spring, is the brainchild of MfA SD and regional math teachers. Directed by Dr. Ovie Soto, MfA SD senior associate and mathematics teacher at Patrick Henry High School, the TLC is dedicated to supporting teachers who are committed to improving the mathematics instruction in their middle and high schools, specifically by thinking deeply about the mathematics in the CCSS-M. This year, 60 SDUSD mathematics teachers are participating in TLC’s monthly sessions and 30 will attend a two-week institute in the summer. 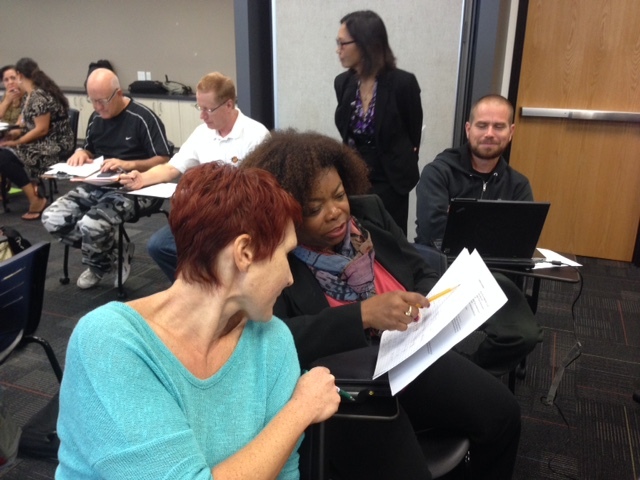 SDUSD math teachers discuss solutions at the first MfA SD Teacher Leader Collaborative Oct. 16. In addition to rich mathematics professional development, each TLC session will feature a guest mathematician. Next month, Dr. Jeff Rabin, professor of mathematics at UC San Diego, will be the speaker. UC San Diego Extension hosts the TLC program at their state-of-the-art facility in University City. Following the TLC presentation, Daro and Edwards made their way to the UC San Diego Faculty Club for lunch with local education leaders, including school district administrators and teachers, and UC San Diego mathematics and Education Studies faculty members. The setting at the Faculty Club prompted an informal question and answer session among Daro and lunch guests. Representatives from the Poway Unified School District excitedly shared how their district was preparing teachers for the CCSS-M by working with UC San Diego Education Studies (EDS) faculty Caren Holtzman and Rusty Bresser, and EDS alum and Poway USD Mathematics Program Specialist/Consultant Andrea Barraugh, all also in attendance at the lunch. 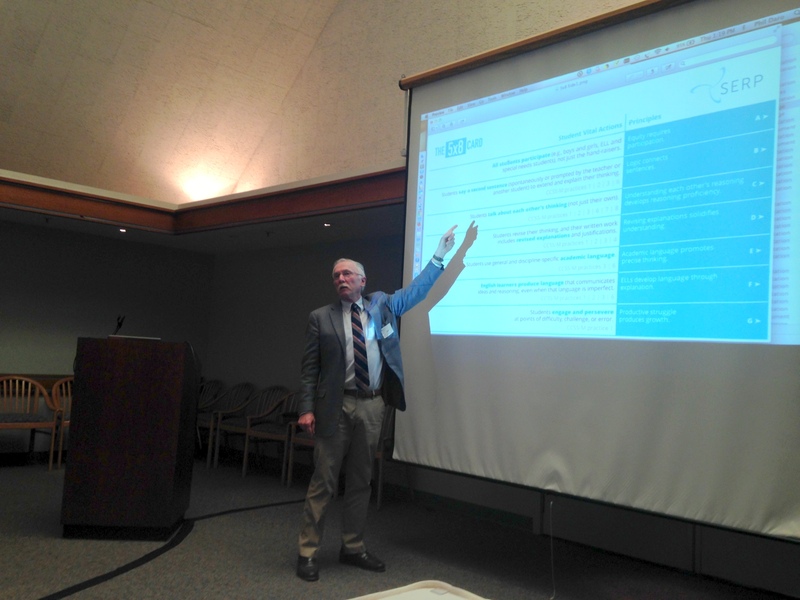 At the Faculty Club, Daro explains the 5×8 Card, a tool developed by the SERP Institute and math leaders in the Bay Area. The card helps teachers and administrators identify vital student action and communication evident in a CCSS-M classroom. 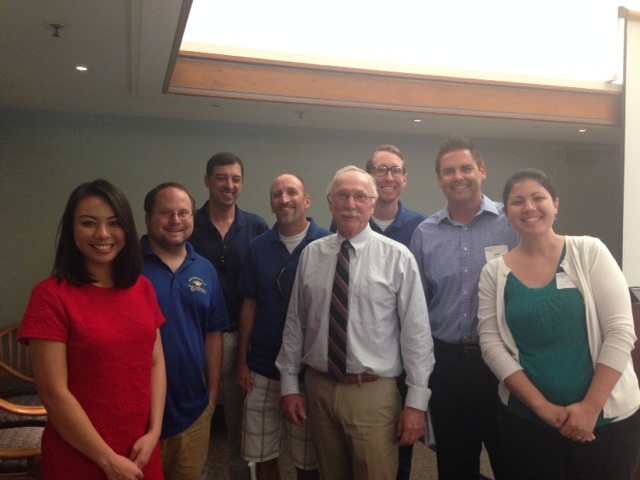 Daro poses with EDS Associate Teaching Professor Chris Halter (third from left) and UC San Diego EDS Noyce Master Teaching Fellows at the Faculty Club lunch. The night before the TLC launch and Faculty Club lunch, Daro was the keynote speaker at a seminar series co-sponsored by MfA SD and SEEE (STEM Education, Economics and Equity), part of San Diego State University’s CRMSE (Center for Research in Mathematics and Science Education). 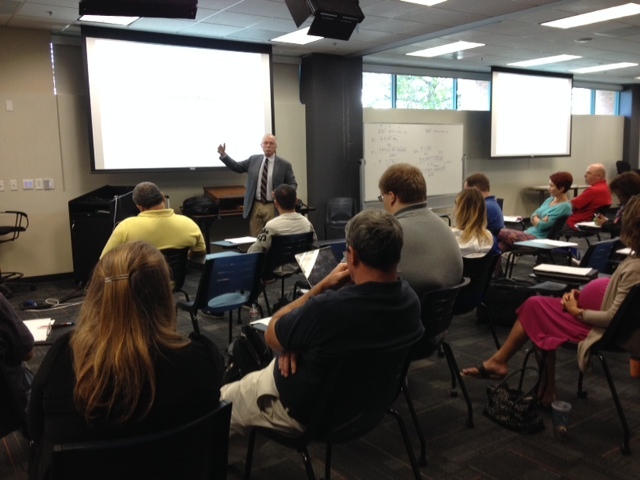 The program, “Demystifying the Common Core State Standards,” attracted a sold out crowd of 180 educators. For more information about Math for America San Diego’s Teacher Leader Collaborative, contact Ovie Soto at osoto@ucsd.edu.